We are offering a 4 night sail at the price of a 3 night sail, or a 6 night sail at the price of 4 night sail, or stay a little longer with a 7 night sail at the price of a 5 night sail. Don’t miss these super savings!!! 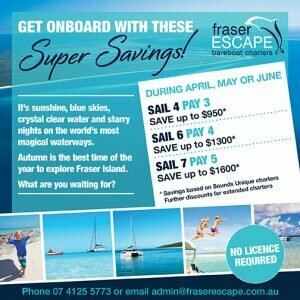 The Hervey Bay and Fraser Island area is a boating paradise and cruising these waterways is a MUST at any time of the year, but why not take advantage of this amazing deal? Or if you’ve always dreamed of seeing the playful Humpback Whales but can’t deal with the crowds and the sea sickness, we can help with that too! Why not charter your own yacht and go whale watching from the privacy of your own deck in the calm, sheltered Fraser Island waters. Talk to the team today to discuss your private whale watching experience.